Unsure as to whether you are taking notes which cover everything they should? Unable to write notes fast enough to keep up with your teacher? This eBook will give you the answers to these problems, and much more. Written in easy to read language, and packed with practical, easily applied tips, this eBook contains everything you need to know to take great notes. To make sure you get the most value for money possible I've also included the FREE eBook: "How to Study: 20 Tips". It contains my best best advice on time management, goal setting and how to get the best grades with the least effort. It's advice that also transfers brilliantly well to professionals, the self employed and anyone working toward mastery of a given field. Do not buy the physical book. The cover was pixilated, the page arrangement was ok minus and as a whole the book looks like a rich teen printed project. From a book that is trying to teach me about how to style and organize my notes, i expected a more polished product. I can't help but feeling somewhat ripped off, especially since i paid for this like 15$ with shipment, and could have brought a real book for the same price. Not sure what Connolly's intention was with writing this book, but his efforts failed for me. Large parts of the subject matter is not just common sense, rather dead obvious. He advises to listen actively, don't write the details, abbreviate, etc which most of us have been told since grade school. Some of the more critical topics were skimmed over with little to no explanation or examples. For example, the advice on mind maps was about one page long with one visual aid. It might show use for some, wasn't to me. I have been out of school for 30 years at least with 2 Doctorates. Would love to have had this back in the day. What I need is a note taking strategies for Speeches / sermons. Not so much for grades but for my own learning use. Good book for help in the college. Yes, I don't like students asking is that going to be on the test. I am glad to see that most of the basic information in this book I learned instinctivly through trial and error. But there is good new information in this book as well. Such as the concept of abbreviation. The work notes was the most helpfull section for me. 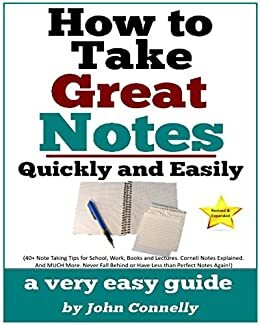 This book was well organized with lots of practical hints for taking notes. I wish I had it when I was in school 40 years ago. The table of contents is especially useful in that the chapter titles provide key information consistently.